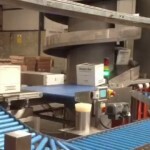 Check out the latest AUTOMATED SOLUTION from Goliath Packaging Systems. Goliath recently installed an Automatic Conveying, Collating and Cartoning System designed to handle 136 juice packs per minute. Packs are stacked, inverted and collated in to 4's before automatic cartoning, gluing and return to upright position. This is another example of Goliath’s expertise in automated product handling and successful project delivery.